“To Live is Christ” – a bold claim. Today at church we sang “Let it be Jesus”, a beautiful song of worship (Click here to listen to it) that had me streaming tears. It occurred to me, however, that many of those singing one of the refrains, “For me, to live is Christ”, probably would not understand what it means in its original context. On the website in the link above, Christ Tomlin talks (in a video) about why the lyric, “For me, to live is Christ” was employed. He says that it happens in the bridge, where the lyrics talk about whether everything is going well, or everything is going wrong, “let it be [about] Jesus”. Not that I am referring to being in need; for I have learned to be content with whatever I have. I know what it is to have little, and I know what it is to have plenty. In any and all circumstances I have learned the secret of being well-fed and of going hungry, of having plenty and of being in need. I can do all things through him who strengthens me. In any case, it was kind of you to share my distress. But here, in the first chapter, that’s not what Paul is talking about. In the first chapter, Paul is in the middle of talking about his predicament under arrest in Rome. He opens the letter talking about his prayers for the Philippian church, and his confidence in their faith. I thank my God every time I remember you, constantly praying with joy in every one of my prayers for all of you, because of your sharing in the gospel from the first day until now. I am confident of this, that the one who began a good work among you will bring it to completion by the day of Jesus Christ. On the strength of that confidence, he assures them that the Philippian church is participating with him in his ministry, though he is imprisoned and they are not. 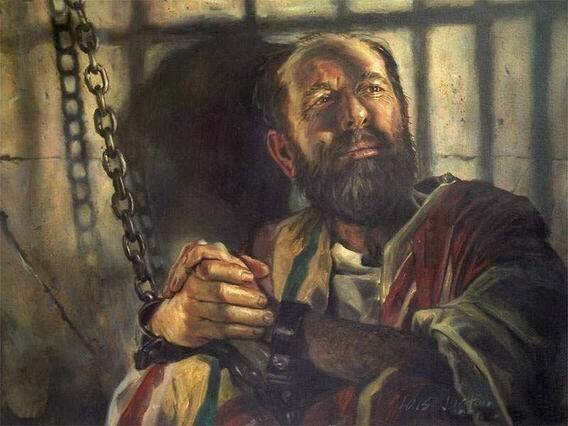 It is right for me to think this way about all of you, because you hold me in your heart, for all of you share in God’s grace with me, both in my imprisonment and in the defense and confirmation of the gospel. I am now rejoicing in my sufferings for your sake, and in my flesh I am completing what is lacking in Christ’s afflictions for the sake of his body, that is, the church. I became its servant according to God’s commission that was given to me for you, to make the word of God fully known, the mystery that has been hidden throughout the ages and generations but has now been revealed to his saints. To them God chose to make known how great among the Gentiles are the riches of the glory of this mystery, which is Christ in you, the hope of glory. In other words, Christ suffered for the church, and as an apostle I serve that church, in turn I am really suffering for you, all so that you might gain this incredible gift – “Christ in you, the hope of glory”. … most of the brothers, having been made confident in the Lord by my imprisonment, dare to speak the word with greater boldness and without fear. Some proclaim Christ from envy and rivalry, but others from goodwill. These proclaim Christ out of love, knowing that I have been put here for the defense of the gospel; the others proclaim Christ out of selfish ambition, not sincerely but intending to increase my suffering in my imprisonment. What does it matter? Just this, that Christ is proclaimed in every way, whether out of false motives or true; and in that I rejoice. What is happening here? Some people are repeating what Paul has been teaching with the intention of damning him… but as they do, they are actually spreading the Gospel message. Not only that, they are increasing Paul’s suffering, which in itself is valuable in the scheme of things as an example to the believers. So whether it is Paul’s emboldened brothers preaching it up, or his nasty detractors trying to defame him, the spread of the Gospel is happening anyway. 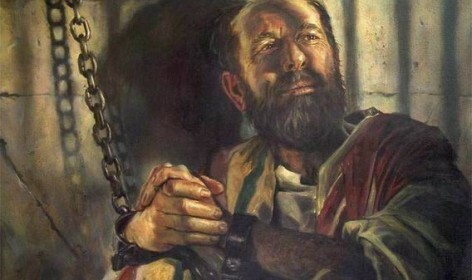 The spread of the Gospel is actually something that causes Paul to remain in chains, destined to die, but what Paul is saying is that this is ok, indeed it is very good. It is my eager expectation and hope that I will not be put to shame in any way, but that by my speaking with all boldness, Christ will be exalted now as always in my body, whether by life or by death. For to me, to live is Christ and to die is gain. Ok. So “To live is Christ” is half of a statement. The other half is “and to die is gain”. When Paul says, “to die is gain”, he means that his anticipation of death is glorious (“my desire is to depart and be with Christ, for that is far better” – verse 23), but he also means that his death will serve the church (“Christ will be exalted … by [my] death” – verse 20). When he says, “to live is Christ”, he means that he is imprisoned, yet falsely accused, suffering, yet innocent. He means that this suffering is of benefit to the church, glorifying to Christ, and gives meaning to Paul’s life and ministry. He means that he is sharing in Christ’s afflictions for the sake of the church. “To live” is to share in the experience of Christ, and that experience was glorious, brutal, fatal, and salvific. I mean that I’m up for that. I mean that I share Paul’s perspective on the Gospel, on the church, and on the self-sacrificing ministry of the apostle. It means that I understand that God’s people, and more so his apostles, are somewhat prone to false accusation, injustice, violence, and even premature death, and that’s ok by me. It means, by inference, the other half of the sentence, that for the apostle “to die” is glorious, worthwhile, and beneficial to the church. It’s a bold thing to say, and I mean it… hence the tears. I don’t know precisely what other people think when they sing it, but for me… to live is Christ. Thank you, Chris Tomlin. Another amazing worship song. More amazing, apparently, than you actually realise.